Hi guys! How's it going? I have been planning this recipe all week long and finally got around to making it today. I've been watching too much Orange Is The New Black lately which is why it took me four days to put this together. Do you guys watch?! If so, let me know what you think of season 2 so far. This citrus sorbet is totally worth the wait though. It's good. It's really really good. My friend came over tonight and he didn't like the beat cheesecake (crazy, right?!) but he really liked this which is the perfect reason to go make this right now. It's a great treat to enjoy on a nice summer evening while watching a beautiful sunset just because it looks like a sunset. So of course it only makes sense. I'll be eating this any time though, sunset or not. The citrus sorbet consists of three smooth sorbet flavors and a whipped coconut topping. The bottom layer is pineapple, the middle layer is grapefruit, and the top layer is pineapple. Basically a citrus party in your mouth, how awesome! Peel and slice oranges, grapefruits, and pineapple. Place in freezer overnight. Place coconut milk in refrigerator upside down overnight. Remove fruits from freezer and blend each fruit separately with 1/3 cup of almond milk. Layer in bowl or glass. Remove coconut milk from refrigerator, flip right side up and open can. Drain out liquid which will leave you with coconut whipped cream. 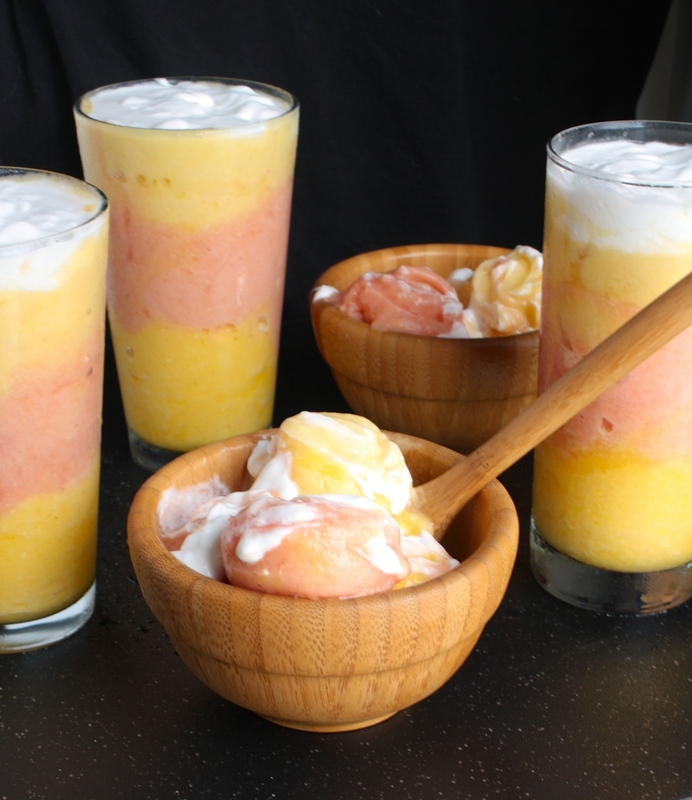 Top sorbet cups or glasses with coconut cream. Serve, enjoy!